For the PC game of the same name, see Phantasy Star Online Ver. 2. Phantasy Star Online (ファンタシースターオンライン) is an MMORPG developed by Sonic Team for the Sega Dreamcast. It was the first Phantasy Star game released in six years, following Phantasy Star IV: The End of the Millennium, and makes extensive use of the Dreamcast's online features. The game was re-released and improved on extensively. This article covers the original Dreamcast release. Unlike the rest of the Phantasy Star series, PSO's prologue starts on the planet of Coral (possibly a splinter colony from the Algol star system). Coral was becoming unsuitable for life, so a pair of colony ships, Pioneer 1 and Pioneer 2, were sent to the planet Ragol, thought to be uninhabited by intelligent life, to colonize it. Pioneer 1 reached Ragol safely, and constructed a colony there. But when Pioneer 2 arrived seven years later, a sudden explosion engulfed the Pioneer 1 colony as they attempted to communicate. The Player (s) take the role of Hunters, mercenaries/bounty hunters/troubleshooters sent down to the source to determine the cause of the explosion, and find any survivors. The game itself is a typical RPG, where you slay monsters on the field, find items, upgrade your equipment, and of course, level up. Episodes I, II and IV differ from many previous games of this genre by offering a real-time, rather than turn-based approach to combat - and seamlessly integrating this with the exploration/plot development aspects of the game. The game still retains a cult folowwing and can still be played through private servers with the Broadband Adapter, Modem and can be used with the DreamPi. To promote the game, Sega "bought" a star and named it "Ragol". 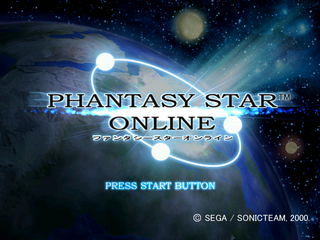 For the Dreamcast update, see Phantasy Star Online Ver. 2. There are four episodes in the series, however only the first exists in the Dreamcast game. This first episode was re-released for the GameCube and Xbox as Phantasy Star Online Episode I & II in 2002 with an additional secondary Episode added in and with new features such as local multiplayer. The third can be seen in Phantasy Star Online Episode III: C.A.R.D. Revolution for the Nintendo GameCube and the fourth, Phantasy Star Online: Blue Burst was released for Microsoft Windows. Lots of times, on the online servers, there would be cameos with Sonic, Tails, Knuckles, and Eggman. The game also contains a few cameo items, such as Opa Opa from Fantasy Zone, Maracas from Samba de Amigo, even a gun created by Dr. Eggman, aptly called the Egg Blaster. Sound Created By: Wave Master Inc.
Sega of America Dreamcast Inc.
Main article: Phantasy Star Online/Magazine articles. Main article: Phantasy Star Online/Promotional material.